The Poteries of Martes are very coveted and almost impossible to find outside of the 'Confit form'. 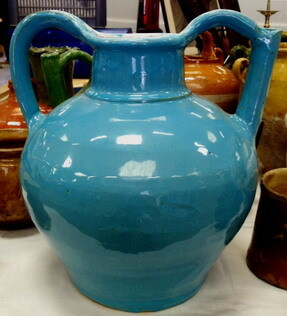 We have managed to find for the first time, the Cruche in Languedoc form in a never found stunning light blue. It is in perfect condition and at 12 inches H. The poteries of Martes were so popular as they were the 'Poor Mans Faience' as a bit of Tin was added to the Engobe (transparent firt glaze application) to give it a slightly more formal, even look than the glazes in 'Terre Vernissee without additions. A wonderful Piece!